When ex-Hong Kong police sharpshooter Lincoln is released from prison after serving time for the alleged manslaughter of a kidnapper during a hostage situation he has only one thing on his mind: revenge on those responsible for putting him behind bars. At the top of his hit list is former colleague and fellow marksman Hartman, who Lincoln believes withheld key evidence at his trial that could have led to his acquittal. Lincoln's plan involves setting up the largest heist the city has ever known, hoping that this will draw his prey to him. Meanwhile, a hot-headed rookie, OJ, has joined Hartman's team and quickly begins to exhibit the same level of shooting skills that made Lincoln such a legend on the force. OJ becomes fascinated by Lincoln, to the point where Hartman worries that he may begin to emulate his former teammate's cavalier attitude towards the job at hand. As the day of the heist dawns, lines are drawn as Lincoln sets out to re-enact the operation that sealed his fate, thereby initiating the ultimate showdown between the three expert snipers. We're happy to give news of the upcoming DVD release of The Sniper a shout on the basis of director Dante Lam's previous The Beast Stalker (Ching yan), a slickly made Hong Kong crime drama starring Nicholas Tse. 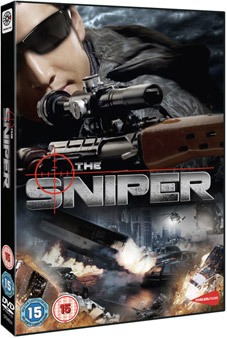 The Sniper is an action thriller in a similar pacy mould, and stars Richie Ren (Seoul Raiders; Breaking News), Edison Chen (The Dark Knight; Initial D – Drift Racer) and Huang Xiaoming (Ip Man 2; The Message; The Founding Of A Republic). Beyond Hollywood.com called it "a wild action movie that goes right for the jugular." Not everyone has been so enthusiastic, but we'll wait and see. The Sniper (cert. 15) will be released on DVD (£12.99) by Chelsea Films on 12th March 2012.